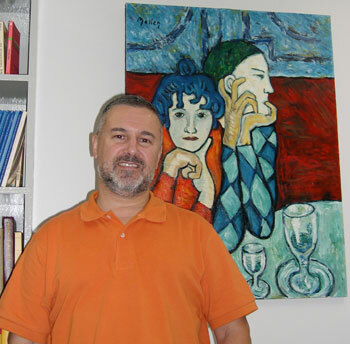 Enrique Mallén, professor in the foreign languages department and director of the Online Picasso Project, studies Pablo Picasso by recreating his work. Mallén's copy of Picasso's "The Two Saltimbanques" hangs in his office. In a world where you can type the words “Pablo Picasso” into Google and get more than 3.5 million hits, it’s hard to imagine a time when typing those same words into an Internet browser would return only one result. But that was the world that existed when SHSU foreign languages professor Enrique Mallén founded the Online Picasso Project to document his research information for the art history classes he taught at Texas A&M in 1997. “You have to understand that in 1997, the Internet was still kind of new; 1995 is really when it took off,” he said. “In 1997, to my surprise, there was one Web site on Picasso, and it was very, very limited. “One of the reasons that I did it was because I wanted to have a Web site on such an important artist in Spanish art,” he said. As the Internet began to grow and his classroom became more and more prepared to handle the phenomenon, the project and its popularity soared. Using his students as researchers, as well as the information he was collecting for the several books he wrote on the artist, they began compiling data to meet the demands of museums, galleries and scholars, including Mallén himself. Today, Mallén’s Online Picasso Project chronicles more than 13,300 of the Spanish artist’s 50,000 works, including thousands of articles, work and exhibition reviews and even plays and poetry, as Picasso was a “prolific writer” as well, Mallén said. Web site perusers can search by year, museum name or city to find high-resolution pictures of all of Picasso’s catalogued works, where they are located, the medium of the work (such as oil on canvas) and the dimensions, among other information. “Not just a Web site,” the project uses “all the innovations of computer science to make a project that is tailored toward the user,” Mallén said. One such museum was El Prado, one of the most prestigious museums in Spain, which contacted him about a year and a half ago seeking information. Like Picasso, Mallén is both a Spaniard and a painter. His goal for the project is to educate his students and the public about “one of the most important artists in the history of art. “One of the things that I really love about the project is that we professors sometimes become isolated from the community because we concentrate on our research and the classes that we teach, but people out there have other ways of doing thing and other interests, so the project keeps me in touch with other realities." The linguist, who speaks Spanish, German and English, came to SHSU this fall and intends on having both the students here continue with the project as well as Texas A&M students who are using it both for and as the topic of their dissertations. Both universities’ computer science programs will also maintain the Web site and update it with Mallén’s programming ideas. The challenges presented in interrelating the various aspects of Picasso’s works, as well as adding his additional almost 37,000 works to the Web site, will make the project an “infinite” one, according to Mallén. “The thing with the project is that the more information you put in, the more challenging it becomes because everything is interrelated. The works are related to biographical facts, critical commentary,” he said. “When we started, 7,000 was hard to relate, but 13,000 is much harder to relate. When you get to 30,000, it’s going to be even harder to manipulate all of this information. The Online Picasso Project is located at http://picasso.tamu.edu/picasso/.